Groups of content players (signs) can be organized under locations and sub-locations. Playlists can be added to locations to display the same content on multiple signs. Playlists can be used as the only content or in addition to sign-specific content. Note Playlists for a location will also affect sub-locations. Repeat steps until all desired locations have been created. The locations should now all have a + or - symbol next to them, and when expanded, show all the players within them. Note a playlist can be used at the unit level location as well. Sub locations are not required. 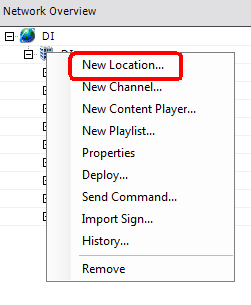 Note A playlist should now appear in the Network Overview within the location that you chose. Right click on the playlist and selet properties. You will be presented with several options. Enabled – This toggle turns the playlist off and on. 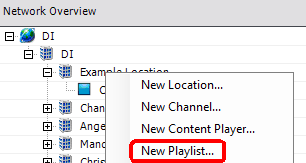 Include only if the player is empty – This option will only play the playlist if the player within the location has no templates directly on it. Always include before player templates – This option will play the playlist first and then any templates directly placed on the player. Always include after player templates – This option will play the playlist after any templates directly placed on the player. Override player templates – This option will play only the playlist and ignore templates placed directly on the player. Once the playlist is configured as desired, drag templates to it just as you would a player. Include only if the player is empty – Content Player will only show Template 1. Always include before player templates – Content Player will play Template 2 and then Template 1. Always include after player templates – Content Player will play Template 1 and then Template 2. Override player templates – Content Player will only show Template 2.